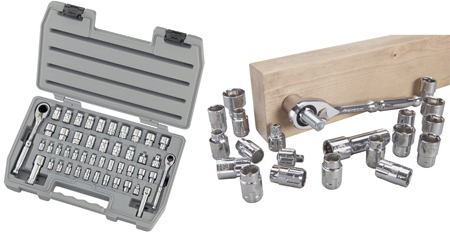 The Thru-Ratchet comes in a 22-piece metric and SAE combination set. The set includes a 1/4″ and 3/8″ socket adapter, a 3″ extension, and sockets in SAE sizes 3/8″, 7/16″, 1/2″, 9/16″, 5/8″, 11/16″, and 3/4″, and metric sizes 10, 11, 12, 13, 14, 15, 16, 17, 18, and 19mm. You can also get the Thru-Ratchet in a two-ratchet, 46-piece set, but after extensive research, I couldn’t find any specs. Lowes.com and Kobalt.com provide little to no info — shame on them. I’m going to make an educated guess that KD Tools manufactures the tools for Kobalt (Lowe’s house brand) — KD has offered a pass-thru system since 2003, and the sets seem to be identical except for the design of the ratchet handle. Kobalt’s versions will definitely be easier to get your hands on, since you can pick ’em up at any Lowe’s. Prices are $40 for the 22-piece and $60 for the 46-piece set. If you have any info on the 46-piece set, let us know in comments. This is likely built for Kobalt/Lowes by Danaher, based off of Gearwrench’s pass-thru system. Was checking this out at my local Lowe’s the other week. It’s distributed by Danaher, but it’s made by our friends in PRC. Whoops. never mind that last comment. hard to keep track of who makes tools for whom these days. Those friends in the PRC who made that set are owned by Danaher. Danaher owns a whole bunch of companies in China. Danaher is much like many other (e. g. Stanley, Cooper, Snap-On) conglomerates in the tool business – who have bought up other companies (sometimes failing ones – where all that was really purchased was the brand names). At my last count the Danaher family of brands included Allen, Armstrong, Easco Hand Tools, Fluke and Fluke-Harris, Gearwrench, Jacobs, K-D Tools, Lea-Way (in China) and Raytek. Same as Gearwrench, I have a Gearwrench set, and the Kobalt driver set that comes with the Flex ratchet handle, the sockets and drivers interchange. So are they cheaper than the gearwrench version or the same? Seems like the gearwrench brand would be easier to warranty at a later date based on their current success. Who knows how long Lowes will carry them. Danaher also owns Matco. Matco’s wrenches and sockets ect.. are the same as Gearwrench, Armstrong, KD… Talk about a huge mark-up !! KABO Tool Company (Taiwan) makes many private label tools that are sold in the U.S. under contract for Danaher, Mac, Matco and even Snap-On. I learned this at an international tool and trade show I attended last month. In some cases, the tools are made as blanks and then stamped with the company logo. Some of the names they make tools for were displayed at their booth such as Matco, Mac Tools (Mac Edge), Bluepoint, Westward (Grainger), and even some of the Kobalt line. But if you want true Made in the USA tools with a lifetime warranty and not have to pay though the nose, try Martin Tools. One of the places you can get this is though Grainger. I would like to replace socket 11(22141) in Kobalt model 22353 Flex Thru-Ratchet Socket Set. Please tell me how much this would cost and if it can be replaced. Has anyone seen a handle for the Kobalt thru ratchet screwdriver heads? The ratchet and sockets work as advertised and I haven’t had a failure in over a year of use however, my standard socket holding devices don’t work with these sockets. The cheap little plastic holder they supply with the small combo metric/SAE set is useless for carrying around the sockets. I can not imagine it would increase the price more than a dollar if they supplied an appropriate carrying case with the small kit. I almost bought this set as I am a kobalt fan-boy, but then I bought a set of ratcheting wrenches and realized they trump this tool. There are only a handful of specialized situations where these thru-sockets would be more useful than a ratcheting wrench, but ratcheting wrenches can be used 99% of the time this set would be used for and more. No need for redundant tools, just get a set of ratcheting wrenches and you’ll be more happy with them than with this set. I purchased the 110 piece set that includes the 1/4″ 3/8″ & 1/2″ drive. It was on clearance at Lowes for $129.99. I really like the set. When clearance is a problem for a regular ratchet these work. I have the gear wrench sets also which are great, but if the bolt head is rising as you are unscrewing it, the gear wrench is hard to keep in the box end. Not the case with this set. Also, they are very strong compared to the standard ratchets since there is no drive square that snaps into the socket that can break with heavy torque. These will take the torque in spades. Really glad I purchased them. I already had plenty of socket sets but wanted this set since I could see the usefulness of it and glad I did. In addition, they are fully no hassle lifetime warrantied! Years ago I was a craftsman fan of hand tools..Wrenches, sockets/ratchets and 20 years ago they were hard to beat. But as with most everything, the quality went to crap with them and I no longer buy them. Snap on is “suppose” to be great, but then again $79.00 for a 3/8 ratchet? And I can say with reasonable certainty that these Kobalt thru sets will out power them by design. My feeling is, once you buy them, you have all the advantages they offer any time you need it and the bonus is, even when you just need a socket for regular work, this will do it just as well and the standard sets too. Just purchased the Kobalt 110 piece thru style ratchet set as mentioned above (inluding 1/2″, 3/8″ and 1/4″ drive) Lowes has all the Kobalt hand tools on clearance and I managed to pick up this set for $79 with tax (50% off list price of 149.99) I will post again once I have used the tools to do some suspension work on our cars. Initially the quality looks pretty good, I am interested to see how they will perform over the long haul. I do not use my sockets everyday, since I am not a mechanic by trade, but they will get their fair share of use in the next few years. The price is phenomenal considering this style socket set virtually eliminates the need for additional deep sockets. After pricing out craftsman sets this set really jumped out at me considering they carry the same warranty that offers a no hassle replacement. I was curious to see if that no hassle replacement was still offered since Lowe’s seems to be clearing out their current stock of Kobalt. I called their customer service hotline and was told that they are updating finishes and the laser etching to make the tools more readable. Out with the old and in with the new, works for those who like a bargain. Bought the 110 piece for $67.05! Set was priced at clearance like Aaaron said except our was priced at $74.50 then used my 10% military discount. That was a deal and more than pleased to add to my tool bench at that price. Went to Lowe’s this past week for a new impact socket and found all of the KOBALT tools on sale at over 50-80% off. $1.76 socket for 0.38. Picked up the ‘Thru-Socket’ set a piece by piece since all of the sets were gone. Asked Lowe’s staff if they were going to a cheaper brand of tool like so many other retailers, and their reply was that KOBALT was repackaging, so the old designs were to be sold off at big discounts. Went to the KOBALT site to check on replacement if and when I needed it, and they don’t even list the tools anymore. They’ve been discontinued. Oh,well. Glad I purchased an extra socket or two for some of the more used sizes. I have purchased several of these sets. I have the 46pc and a couple of the 110 pc sets. I thought they are very nice for the price. They remind me of Snap Ons. I purchased my first set at Lowes last year for 150.00, then 3 more 110pc sets at Lowes about 4 weeks ago at $74.95 while they were yellow tagged. Very good price for the value of tool. 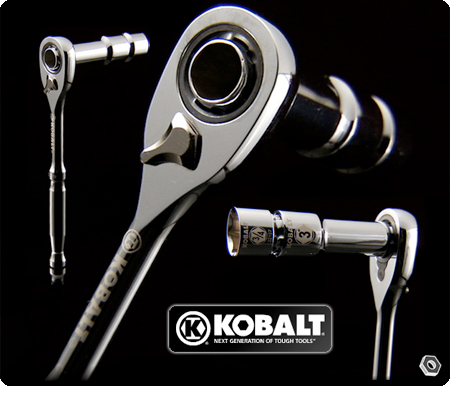 I also have the newer sets they came out with by Kobalt, and I prefer the thru-ratchet style much more quality wise. Do you want to sell one of the 110 piece sets ? By using this device bolt can be torqued, but how can understand torque value? I am searching for a tool which had a hole and by the way show me the torque value. Is there any body, can help me find the proper tool?